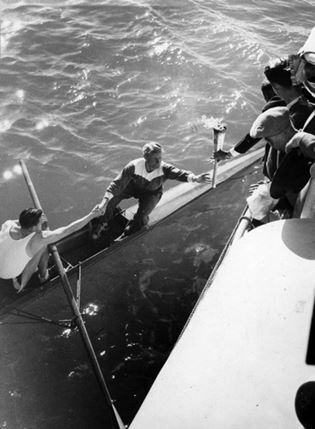 The 1952 Olympic Torch on its way in to Malmö, rowed by a crew from the town’s local rowing club, Malmö RK. 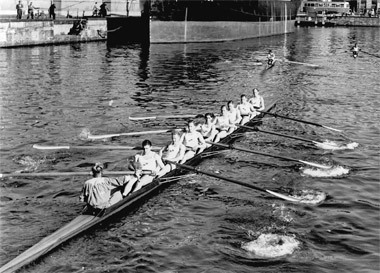 After reading Tim Koch’s recent article about the Olympic Torch, where there was a photograph of Sir Steven Redgrave sitting in a ’Henley eight’ holding the Olympic Torch, I became curious about how many rowers through the years since the Olympic Torch Relay began for the 1936 Games had been involved in getting the Olympic flame to its final destination – sitting in a boat. A quick Google search showed that there were probably quite a few, and it would be impossible to find and name them all among all those thousands and thousands of torchbearers who have had the honour of ’transporting’ the flame for a leg in an Olympic Torch Relay. However, I personally knew one of the ’rowing torchbearers’, Lennart Månsson, a member of my club in Sweden, Malmö Roddklubb (Malmö RK). For the 1952 Olympic Games in Helsinki, 1,416 torchbearers took the torch through four countries to Helsinki. The torch went from Olympia to Athens in Greece, then by airplane to Aalborg in Denmark to Odense to Copenhagen, from the Danish capital by ship to Malmö in Sweden, to Gothenburg and Stockholm, up to the border town of Tornio in Finland, to Oulu and finally to Helsinki. The torch being handed to Lennart Månsson, cox in Malmö RK’s eight. When the ship that took the torch across the Öresund straight between Copenhagen and Malmö reached the outer Malmö Harbour, the torch was picked up by an eight from Malmö RK. The cox in the boat was Lennart Månsson, who held the torch high while the crew rowed it from the harbour into the canal that surrounds the Old Town of Malmö. Arriving at the rowing club, the torch was handed over to some canoeists from the town’s canoe club. Being a part of the Olympic Torch Relay for the 1952 was a great honour for the club and it was with great pride that members of the eight told us youngsters the story two decades later. The Malmö eight had actually been training hard to get picked as Sweden’s representative in the eights at the 1952 Games. The club had even hired a German coach, Walter Ulrich, in 1951 to increase the crew’s chances. However, they failed to be selected. For the 1952 Olympic rowing, Sweden sent a coxed pair, a coxless pair, a double scull and an eight – none of the Swedish crew made it to the finals. 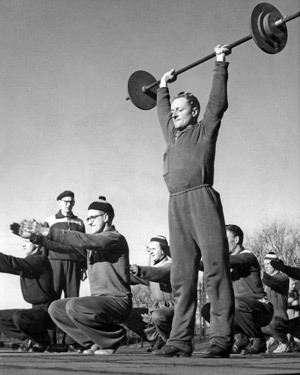 Standing in the foreground, Lennart Månsson, and the rest of the Malmö RK eight training for the 1952 Olympic rowing. Standing in the background is the club’s German coach, Walter Ulrich. Although Månsson later gave up his active rowing career, he would continue to row recreationally almost every day year-round as long as there was no ice on the canal. He took a single scull and sculled on the canal, around the Old Town, a 4,5km-long outing, dutifully putting down all his outings in the club’s rowing log book. After his outing in the single scull, he went swimming 1,500m in one of Malmö’s indoor pools. 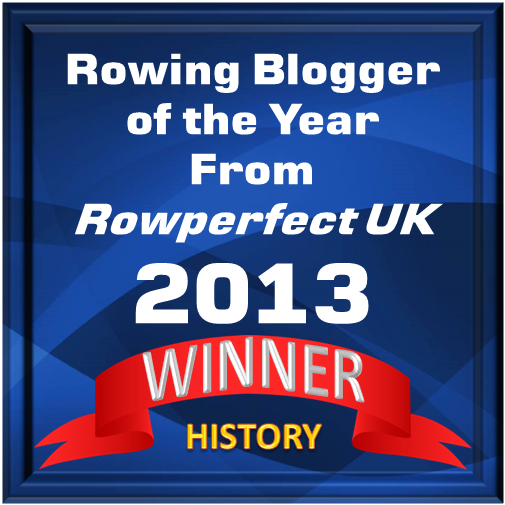 In 1982, at the age of 63, when Månsson had rowed 5,000 outings, he decided to start competing again. He and another veteran at Malmö RK, Curt Christensson, who was seven years Månsson’s junior, sent an application to the 1982 World Veterans/Masters Regatta in Nottingham where they competed in the double sculls. They also sculled at a Masters Regatta in Scotland a couple of years later. Lennart Månsson continued to scull well into his upper 80s. He might not have been Sweden’s best rower, but for sure he was the country’s most devoted sculler. When Månsson died in September 2014, at the age of 95, he had, during his 74 years as a member of Malmö RK, more than 9,000 outings down in the club’s rowing log book. Say that each of Månsson’s outing was at least 4,5km, and the circumference of the Earth at the Equator is 40,075km, that is at least one trip around the world in a rowing boat – that is quite an accomplishment; that and being an Olympic torchbearer! Special thanks to Per Ekström, president of Malmö Roddklubb, who provided information for this article. Photographs courtesy of Malmö Roddklubb.